How much of Wi-Fi bandwidth would be used depends on how big is your video streaming size, and video streaming size would be influenced by the video content. For example, dynamic video content (e.g. room full of people moving) will result in bigger video streaming size than static video content (e.g. empty room). In most conditions, SpotCam will use 0.2 Mbps to 0.5 Mbps of your “upload” bandwidth. A easy way to determine whether you have enough upload bandwidth or not is to visit http://www.speedtest.net and click "Begin Test" in the center of the screen, you will then see both your download and upload bandwidth. Make sure you are doing this test from a computer that is connected to the same network as the SpotCam. Don’t use a mobile device for the test as the bandwidth may be limited by mobile device itself. To help users with limited upload bandwidth in the house, SpotCam provide the option to switch video resolution from HD to SD. HD resolution is 720P, which is bigger than SD resolution 480P, and a smaller resolution can help reduce the video streaming size hence reduce the usage of Wi-Fi bandwidth. 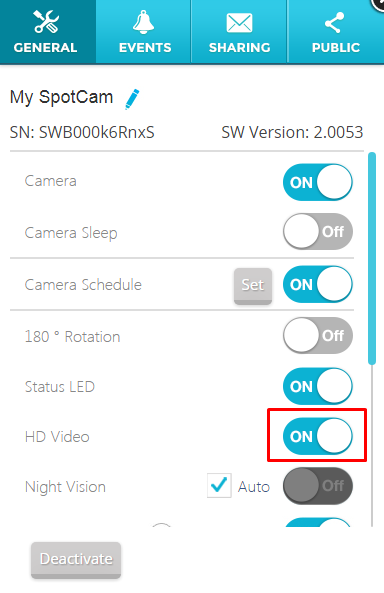 To do the resolution switch, please visit MySpotCam.com with your computer and go to video watch page, and then go to “GENERAL” tab of camera setting window. HD resolution is used when “HD Video” is on, SD resolution is used when “HD Video” is off.